A major theme that seemed to keep coming up for me this week was the topic of confidence in central bankers. It’s clear to me that markets are not driven by business fundamentals but rather by what central bankers plan to do next at any given moment. I routinely see headlines such as “Wall St dips, but hopes grow for central bank actions” [1, Reuters] or “European stocks hit multiyear highs on hopes for ECB easing.” [2, Market Watch] Whereas it should be economic activity and growth that fuels increases in the stock market, it’s central bank intervention that is truly fueling these increases. The big news this week was the European Central Bank’s announcement of American style quantitative easing in which they will print 60 billion euros per month for 16 months [3, Peak Prosperity], which is actually an increase from what was leaked to the press earlier in the week. [4, RT] In a podcast discussion between Chris Martenson of Peak Prosperity and Mish Shedlock of Mish’s Global Economic Trend Analysis, the real reason for quantitative easing (money-printing) is called into question. Central bankers frequently suggest that this money-printing is done in order to spur lending and therefore stimulate the economy. However, in Europe the banks have so much cash on hand that they have to deposit all the excess cash at the central banks, which currently have negative interest rates as low as -0.75%. So banks are essentially opting to pay money to keep all their excess cash rather than lend it out – which flies in the face of the theory that banks need more money to be able to lend more. Rather, Chris and Mish put forth that the real reason for money-printing is to devalue the currency and enable debt accumulation and deficit spending so that actual structural reforms can be avoided. Basically: kick the can down the road. Another point worth adding here, not one that I read this week, is the possibility that banks refuse to lend (despite having access to free money) because they want to build up their own cash reserves to cover debts held on their books. In other words, they’re insolvent. 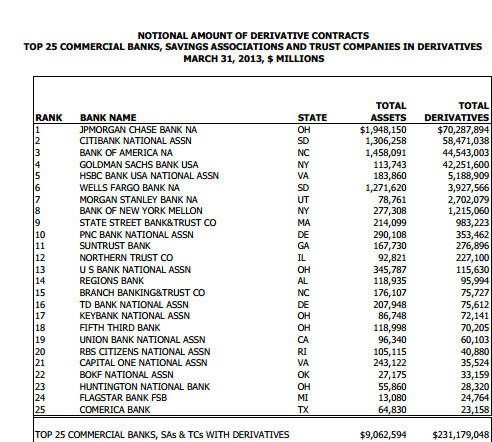 Bank of America is ranked third on the list of derivatives exposure and as such I’ve opted to keep my money at a bank that isn’t on the list so that if a financial crisis comes I’m less exposed to the risk of losing my money to an insolvent bank. This seems like a no-brainer to me, especially with talks of not bailing out the banks if another crisis comes as it did in 2008. Although confidence in central banks was the biggest focus of my attention this week, there were other articles that caught my attention as well. Somewhat related to topic above is oil. Because all of the “growth” in the economy has been manufactured by central banker manipulation, the demand for oil has been declining since there’s not enough real economic growth to support high oil prices. John Greer of the Archdruid Report blog writes, “To maintain economic production at any given level, the global economy has to produce enough real wealth — not, please note, enough money, but enough actual goods and services — to cover resource extraction, the manufacture and replacement of the whole stock of nonfinancial capital goods, and whatever level of economic waste is considered socially and politically necessary. If the amount of real wealth needed to keep extracting resources at a given rate goes up steeply, the rest of the economy won’t escape the consequences: somewhere or other, something has to give.” In this case, it was the price of oil. [11, Archdruid] With oil prices dropping over 50% in only half a year’s time, the only oil that will be cost effective to continue drilling will be from conventional wells. Unfortunately conventional wells do not produce enough oil to meet world demand, so in time the laws of supply and demand dictate the cost of conventional oil will increase as well. This will in effect become a self-perpetuating feedback loop of demand destruction by which world oil production begins to vanish. All of this is to say that the the world is on a tight geopolitical fuse, and there are a number of hot issues around the world that at any moment could be a trigger for instability in the financial markets. Nobody can know for certain which trigger may get pulled or when, but everybody should be aware of just how fragile the whole system is. Between central bank manipulation of markets, plunging oil prices hastening peak oil, moves away from dollar hegemony, and geopolitical tensions that could spark further armed conflict at any moment – we are in for a potentially roller coaster 2015. Buckle up. “Wall St dips, but hopes grow for central bank actions.” Reuters, Jan 20 2015. “European stocks hit multiyear highs on hopes for ECB easing.” Market Watch, Jan 20 2015. “Off the Cuff: Central Banks Gone Wild.” Peak Prosperity, Jan 23 2015. “Europe’s €500bn plan to save itself from economic ruin.” RT, Jan 19 2015. “The Consequences Playbook.” Peak Prosperity, Jan 21 2015. “Axel Merk: Why Asset Prices Must Return to Lower Levels.” Peak Prosperity, Jan 24 2015. “We Are in a Financial Melt Down – Nomi Prins.” USA Watchdog, Jan 18 2015. “EU better off with ‘helicopter checks’ not QE.” RT, Jan 22 2015. “Countries Race to Repatriate Gold, Reveals Concern Over Impending Financial Crisis.” The Sovereign Investor Daily, Jan 21 2015. 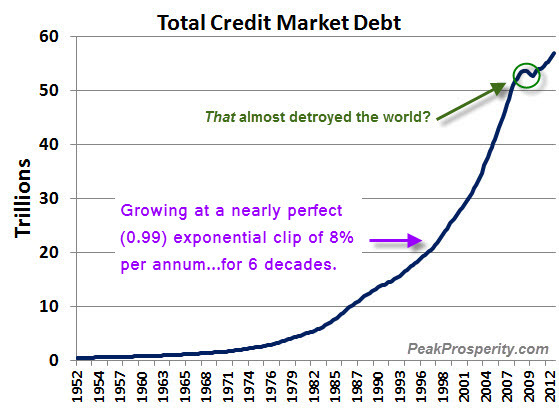 “When This Ends, Everybody Gets Hurt.” Peak Prosperity, Jan 21 2015. “March of the Squirrels.” The Archdruid Report, Jan 14 2015. “Oil Industry Withdraws From High Cost Areas.” OilPrice.com, Jan 17 2015. “Russian Central Bank voids Standard & Poor’s, Moody’s, Fitch ratings.” RT, Jan 19 2015. “‘What a dreamer!’ Rogozin ridicules Obama claim of Russian economy in ruins.” RT, Jan 21 2015. “Lavrov on Obama speech: Efforts to isolate Russia will fail.” RT, Jan 21 2015. “China, Switzerland sign deal on yuan trading in Zurich.” RT, Jan 22 2015. “Two ways of terrorism: theirs v ours – Chomsky lambasts US for drone attacks and media deaths.” RT, Jan 20 2015.